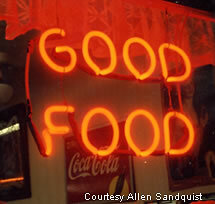 The neon still lights up the sky at Boulder City, courtesy of Harry's Cafe. Back in the day, the location was occupied by the Green Hut, then went by the name of Harry's Cafe. Today, the top of the sign has been changed to reflect the existing businesses there, the Coffee Cup Cafe, after the owners were not allowed to move their original sign a few doors down from their old location. (Far left) Take a look at the neon of Harry's Cafe of Boulder City, Nevada. (Left) Here's a close-up of the neon window advertisement. Can't get any better than this. The neon glow from this roadside diner comes from Joe's in Reno. This is the diner that used to be called the Blue Star until recently. At the Flyin' Pig BBQ in Winnemucca, piggies are all the norm. Check out the neon out front and the his and her's neon piggies below. Looks healthy and hungry. 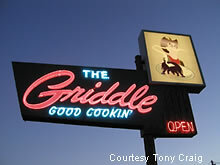 The Griddle in Winnemucca features a neon sign that catches the eye of weary travelers cruising along the main drag. The Griddle opened back in 1948. For more information, see this website.